In the world of smartwatches, Skagen has carved itself out a nice little corner putting together wonderfully minimalist hybrid watches. Now it's taking the next step and introducing a full-on, touchscreen-packing smartwatch. Announced at CES 2018, the Skagen Falster embraces Google's Wear operating system. As you can see, it's pretty simple in looks, opting for a pretty standard round design that lets the display tell you everything you need to know. On the left, there is a single dial. Up at the top and bottom you have semi prominent, but simple, lugs connecting the straps to the casing. Efficiency and speed are the big goals with the Falster. 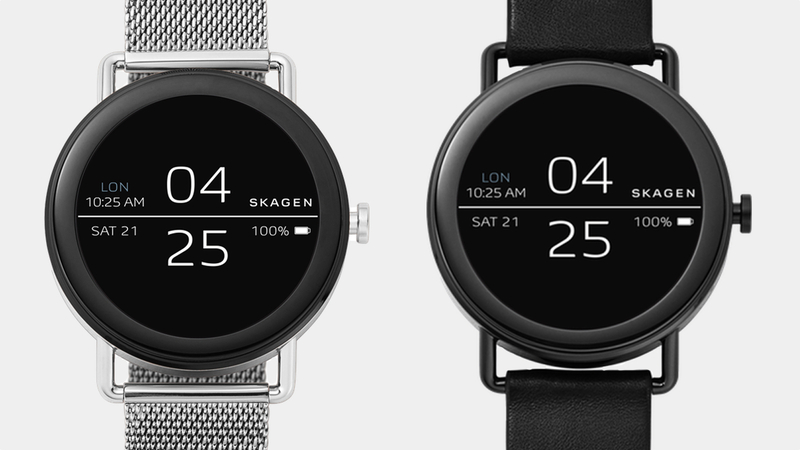 Skagen says the smartwatch is built around "Function-Based Dials". That's a fancy way of saying the watch faces are built to give you the information you need to know quickly and efficiently. There are no fancy graphics recreating an analog watch here. Just pure simplicity. That simplicity has a second purpose: Battery life. The dials that Skagen is showing off first are black with simple white text. While Skagen doesn't outright say the watch is using an AMOLED display, it does say this simple design makes it more battery efficient. We don't have too much on specs, but we do know that it runs Android Wear 2.0 on Qualcomm's Snapdragon Wear 2100 processor. You'll also get the features you expect from a Fossil Group designer smartwatch, including activity tracking, notifications, music, Google Assistant support and interchangeable straps. The Skagen Falster will come in four different colorways. Two of them will be metal mesh straps in both stainless steel and rose gold, while a third will come with a black leather strap. The metal mesh straps will retail for $275 while the leather strap version will retail for $295 when they release in January 2018.